There is forced silence prevailing in the valley, which some perceive as peace. But everyone is well aware of the fact that even a small incident can snowball into a major unrest. However current mood in pro-freedom camp caught by inertia and controversies hardly suggests anything challenging for the government, at-least till 2014. The date set for US led NATO withdrawal from Afghanistan, which many analysts suggest will be challenging period for Pakistan, but many believe post-withdrawal equation may favour Pakistan and may see increasing Iran-Pakistan cooperation in Afghanistan, unlike the past. Events in Kashmir have largely been influenced by situation in Pakistan. Today Pakistan has number of issues to worry about and finds it hard to continue its backing to Kashmir struggle the way many Kashmiris and Pakistanis themselves would want it to do. From many years Pakistani establishment has been pushing for some sort of “compromise solution” and by and large has remain content and in a way helped in pushing Kashmir to cold storage. 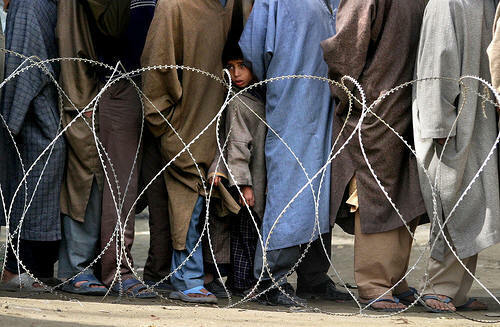 Even some reports say India and Pakistan are involved in some behind the curtain negotiations on Kashmir, which may see some ‘Confidence Building Measures’ about Kashmir but shorn of altering the status-quo, despite it being fraught with dangerous consequences. By and large politicians of all hues and cries in J&K are seen as political employees of governments of India and Pakistan. Unfortunately same holds true for majority of leaders claiming to fight for freedom and rights of Kashmiris. For the past six decades world saw Indian and Pakistani leaders meeting to discuss Kashmir issue keeping their respective national interests in mind, with tone and tenor of Kashmiri leaders hardly suggesting anything relating to Kashmiri interest or different to what India and Pakistan had to say. With Kashmiri leadership lacking independent approach and voice about their own issue world saw it as bilateral problem to be solved by India and Pakistan, that too despite people of Kashmir having suffered immensely and being the prime party to the dispute. Though strong and stable Pakistan is must for resolution of Kashmir issue but complete reliance on Pakistan has in a way harmed our cause and in-fact pushed Pakistan towards trouble as it has also suffered due to lingering of Kashmir issue. Pakistan’s maneuvering of ideological dissent in Kashmir compounded the problem. Had India pushed Bangladesh’s (then East Pakistan) Mukti Bahini to urge for accession with West Bengal, the issue would have been still there even now. Despite being a legal part of Pakistan according to partition plan of 1947, India’s military intervention in East Pakistan was seen as support to Bangladesh’s national struggle not an attack on Pakistan’s sovereignty. But Pakistan miserably failed to do the same in Kashmir despite being the fact that Kashmir is an internationally recognized disputed territory and instead neutralized half of the population in 90’s by supporting a particular group only and thus undermined Kashmir’s national liberation struggle. The question of Independent Kashmir is not new and in-fact was there since the inception of Kashmir dispute. Abdul Qayoom Khan, ex-Prime Minister of Azad Kashmir and leader of Muslim Conference, who swears by accession of Kashmir with Pakistan mentions in his book “Muqadma-e-Kashmir” that on June 4, 1947 Lord Mountbatten presented partition plan in a press conference and about the status of princely states he said they are free to choose whether they can opt for independence or merger with India and Pakistan. According to him Nehru was against granting princely states the option of Independence, however Quaid-e-Azam Muhammad Ali Jinnah supported the move. Further he mentions that in the convention of Muslim Conference on 19 July 1947, Choudhary Hameedullah Khan presented resolution for opting independence for Kashmir. He says at that time people of Kashmir had only three options merger with India, merger with Pakistan or Independent Kashmir. However later Muslim Conference voted for accession of the state with Pakistan. And as such “instrument of accession” which India claims was signed by Maharaja Hari Singh which even if believed was signed by him is temporary in nature and needs to be subjected to ratification or rejection by people. Hence that exercise has to be conducted for its ratification or rejection by the people in shape of referendum and that too has to contain option of independence as Kashmir was a princely state in 1947. Even UN resolutions on Kashmir do not negate option of Independence as many believe so. UN resolution of 13 August 1948 state “Kashmir is a disputed territory whose future status shall be determined in accordance with the will of the people.” To determine the future status it can have any number of options. It is UN resolution of Jan 5. 1949 which limit choice between India or Pakistan only. In total there are 18 resolutions favoring right to self-determination of Kashmiris. However passing of one resolution doesn’t mean previous one is discarded. These all resolutions are complementary in nature and must be seen in its totality. Right to independence is essential ingredient of right to self-determination and no individual, group or party has right to circumscribe it. By putting restrictions of accession with India or Pakistan only it ceases to be right of self-determination and rather becomes right to accession. So every party belonging to the APHC has legal obligation to explain right to self-determination, they can’t elucidate it before the public as per their own personal wish as they are constitutionally bound to stress on the three options included in this exercise as otherwise would be violation of APHC constitution. More-ever Kashmiris in many opinion polls conducted so far have overwhelmingly voted for Independence as their preferable choice. Still after rendering innumerable sacrifices by Kashmiris logjam and stalemate continues over Kashmir. It is high time that leadership gives a thought for change in approach and strategy about Kashmir struggle. That will be befitting tribute to all martyrs of Kashmir and only way of achieving long lasting peace in the region.